Contains three animated stories for children on the Passion. Worthy Is the Lamb -- Experience the Passion of Christ. Witness the fulfillment of ancient prophecies. Pray with Jesus in the Garden of Gethsemane, "Not my will, but thy will be done." Feel the betrayal of Judas' kiss. Endure the trial and crucifixion as Jesus willingly submits. Rejoice in the knowledge that Jesus' death and resurrection provides pardon for our sin. He Is Risen -- Learn the story of the greatest miracle of all, the resurrection of Jesus Christ. Sorrow and despair at the Lord's crucifixion become complete joy and love as the disciples behold their resurrected Master three days later. The events of the real story of Easter teach of the atonement and resurrection, providing hope to Christians around the world. The Kingdom of Heaven -- Jesus taught his followers about the day of His Second Coming through short stories, called parables. The Kingdom of Heaven presents some of these parables including the Sower and the Seed, the Wheat and the Tares, and the Ten Virgins. Each story teaches us how to live our lives as we look forward to his return. Babylon forces invade Jerusalem and carry away many of the city's finest young people, including Daniel and his three young friends: Shadrach, Meshach, and Abednego. During a series of events in Daniel's life¾serving King Nebuchadnezzar, being placed in jail, interpreting the king's dream¾we learn the values of patience and trust. When Daniel is thrown into the lion's den, he proves that God still rules over the affairs of men! Not So Golden Calf: Episode #1 -- The Not So Golden Calf is the adventure of a lifetime as 11-year-old Seth, his mom, Leila, and his quirky animal companions learn firsthand the meaning of two of God­s commandments -- "Do not worship any other gods besides me" and "Do not make idols of any kind." While Moses is up on Mount Sinai, the people of Israel lose faith and are convinced by Hazzaka to build an idol and worship another god. Rest Is Yet To Come: Episode #2 -- The second episode in the series, A Day in the Strife, is based on commandments three and four -- "Do not misuse the name of the Lord your God" and "Remember to observe the Sabbath day by keeping it holy." When Seth's mom, Leila, is called away, snarly old Jeshanah is asked to take care of Seth. Not the wisest choice, since Jeshanah swears (conveniently an animal noise or sound covers the actual words) and proudly sings of his warped sense of values. Plus, Jeshanah makes Seth and all the animals work themselves to the bone on the Sabbath. Thankfully, Moses and Seth's mom arrive in time to set Jeshanah straight. Life and Seth Situation: Episode #3 -- The third episode in the K-10-C series is based on commandments 5 and 6 - "Honor your father and mother" and "Do not murder." When Seth and his friend, Ephraim, go for a "sleep over" on the outskirts of camp against their parents' better advice, they encounter a ragtag bandit and his gang on a pursuit across the desert. A sandstorm forces them into a cave that just happens to be the bad guys' hideout. The Boys learn the value of obeying their parents and the sanctity of human life in this exciting adventure filled episode. Stolen Jewels, Stolen Hearts: Episode #4 -- Amos the Rat is accused of stealing food all over camp, but this time everybody's favorite rodent is innocent. Simeon, the smooth, drop-dead hunk of a singer, becomes the real rat as he tries to woo Matthew's beautiful wife, Sara, with his beautiful singing voice. Meanwhile, Simeon's sly monkey, Martel, makes a move for another type of treasure - the kind that's gold and silver. Everyone is set straight in the end as they discover the consequences of betraying a sacred trust and stealing from your neighbors. Toying With the Truth: Episode #5 -- The finest clothes, the best toys, the coolest pets -- Seth becomes jealous as he covets the possessions of his best friend, Ephraim, and longs to be "the boy who has everything." When he accidentally breaks Ephraim's amazing new birthday gift, Seth sets up his friend to take the blame. Join the adventure as the people of Israel prepare to leave their camp and continue on their journey to the Promised Land in this series finale of the Kid's Ten Commandments. This is a parable of a wayward youth who returns home to his father and family after squandering his inheritance with loose living. Children will learn about God's encompassing love for those who humbly repent of their foolish ways and the rewards kept for those who do not waste what is entrusted to them. This marvelous animation introduces the Ten Commandments in stories that children of today can relate to and understand in their own way. Its central characters are youngsters dealing with the common situations of a child­s modern daily life -- at home, in school, or playing with friends. The family is of central importance in this DVD, because it is within the family circle that children grow and learn best. Quite often children find themselves in situations in which they are challenged to make the right choices, and those right choices must be guided by the Ten Commandments of God. Each Commandment is taught in the form of an easy-to-understand story, and each "Commandment Story" is a separate chapter on the DVD. Every chapter begins with a cheerful monk-teacher, who introduces the story with a friendly reminder that Jesus gave us the single Greatest Commandment of them all -- "Love one another as I have loved you." Designed for ages 2 through 8. A 13-page PDF Teacher's Guide is included on the DVD-ROM, when the DVD is accessed from a computer. I am the Lord your God? 1. Do not have another god before me. 2. Do not take the name of your God in vain. 3. Keep holy the Sabbath day. 4. Honor your father and mother. 5. Do not kill. 6. Do not commit impure acts. 7. Do not steal. 8. Do not bear false witness. 9. Do not covet your neighbor's wife. 10. Do not covet another's things. 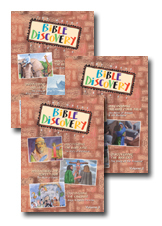 Learning the Bible becomes an exciting adventure with the Great Bible Discovery Series . Join host David Mead as he guides the way through classic stories of the Scripture, explaining the action and posing questions in a fresh, entertaining way. Each of the episodes on these three DVDs features a lively interactive approach with live action mixed with storybook style animation. Great Bible Discovery Volume 1 Discovering the Beginning -- The Story of Creation recounts the miraculous creation narrative from the electrifying power of the first flash of light through the tragic fall of paradise. Discovering Dry Land -- The Story of Noah's Ark follows a faithful man named Noah through one of the most loved stories of the Bible. Noah obeys God's instructions without question in a race against time and the elements. Covenant Discovery -- The Story of Abraham follows the tremendous story of one man, Abraham, and his unceasing faith in the Lord. Great Bible Discovery Volume 2 Discovering Dreams Come True -- The Story of Joseph and His Brothers follows the remarkable life of Joseph, whose forgiveness and faith in God saved his sometimes jealous family. Happily-Ever-After Discovery -- The Story of Ruth focuses on the faithful heroine Ruth, whose life of love and loyalty serves as an example to everyone in God­s family. Discovering the Way Out -- The Story of the Passover follows the Israelite people as they prepare for the greatest escape in history. From the burning bush to the crossing of the Red Sea, God calls Moses to lead the way to freedom. Great Bible Discovery Volume 3 Discovering the Baby King -- The Story of Christmas follows the search for the baby Jesus from the prophets of the Old Testament through the hunting of King Herod. Discovering the Empty Tomb -- The Story of Easter follows Jesus from his triumphant entry into Jerusalem on Palm Sunday to his glorious resurrection on Easter morning. Discovering the Kingdom -- Jesus' Kingdom Parables retells a handful of Jesus' favorite stories: the parables. From the parable of the sower to the parable of the ten bridesmaids, Jesus explains to people of his time, and to all of us, what his mysterious kingdom is all about. Episode 10: The King Needs Help -- King Saul is slipping into mental illness, but he won't accept help from his family or from the prophet, Samuel. God Leads Samuel to secretly anoint a new king who will eventually take Saul's place. How will the king react when a boy named David has enough faith to obediently follow the Lord's calling? Episode 11: Death Waiting -- Now a leading officer in King Saul's army, David enjoys one victory after another, but his success fuels the king's anger and jealousy, How can Prince Jonathan, son of King Saul, do the right thing when his own father plots to kill his best friend, David?